The 26 Best Gluten Free Flours For Baking & Breadmaking ?? ? Home » Gluten Free 101 » The 26 Best Gluten Free Flours For Baking & Breadmaking ??? The Best 26 Gluten Free Flours For Baking & Breadmaking ?? ? Hitting the gluten free flour isle might seem overwhelming at first, with row after row filled with gluten free flours hailing from every corner of the world. But worry not, as with a few simple rules, gluten free baking will become well… a piece of cake. Also, keep in mind that over here at Gnom-Gnom, it is at the core of our gluten-free baking philosophy to use the myriad of gluten free flours at our disposal to create outstanding textures and flavors. Rather than simply attempting to imitate wheat flour. As lets face it, second parts are never quite as good. Long before gluten free baking became a craze, European, Middle-Eastern and African cultures have used gluten free flours in their traditional cooking. From desserts (think almond-based French macarons or Italian polenta cakes), to breads (corn tortillas in Mexico), rice flours in Japanese desserts… and many many more. Why? Simply because gluten free flours lend great flavors and interesting textures to the mix. You also might not have realized that gluten is not always a friend in baking (i.e. it’s more like a frenemy!). Think muffins and cakes, where instructions state to not over-mix. They are essentially asking you not over-develop the gluten, or you’ll risk ending up with a tough crumb. So gluten free flours are actually particularly good in any baked good which is not meant to be hard as a rock. I.e. in most sweet treats if you think about it. Bread, pizza and pastas pose the biggest hurdles for the gluten free baker, but as they say: there ain’t no mountain high enough. And here is where binding agents and flours such as teff, sorghum and garbanzo come in. Their flavor profiles and varying hardness do a killer job in yeasted loafs to achieve rise, texture and proper browning. The Best Gluten Free Flour Mix ? Now let’s get something clear right off the bat: there is no such thing as ‘the best gluten free flour mix‘. There is simply no all purpose gluten free flour mix out there which will work great for every single occasion. Rather, you will use a gluten free flour mix as the base for most your recipes, adding harder or softer flours depending on the recipe for best results. Bob’s Gluten Free All Purpose Flour is the most wholesome and nutrient dense of the lot. Primarily garbanzo based, it’s killer (in different ratios) for yeasted breads, pie crusts, muffins and cookies. It lends a great bite (i.e. no gummy business) and helps breads to rise and brown nicely. Having said that, if used alone it will result in a slight garbanzo taste so we suggest always mixing it with a rice and sorghum mix. Bob’s 1-to-1 Baking Flour is a good rice and sorghum based mix to have around. It makes the most pliable ‘flour’ tortillas ever, and helps to balance out the previous mix. When used alone though, we find that it is not hard enough not to result in a gummy loaf. So aside from ‘flour’ tortillas, always mix it up! Better Batter would be our preferred mix if it were less pricey (it’s $1/ounce!!). It’s probably the best balanced of the lot, and the closest thing out there to a cup for cup mix. Thus great for special treats. Having said that, we still like to mix in harder flours with it to improve the crumb in breads and to make it more nutritionally dense. Cup4Cup is one of the preferred mixes out there, and there is reason why. You can use it as a substitute throughout our recipes which call for a rice-based mix. Having said that, we find it results in starchy loafs when used on its own. And it’s not particularly nutrient dense either, with its high percentage of cornstarch (about 25%) and milk powder (about 10%). If you are bringing in your own gluten free flour mix to the table, make sure you read up on the ingredients. Our recipes are developed around gluten free flour mixes with 60-80% medium and hard flours, and 40-20% starches or soft flours. 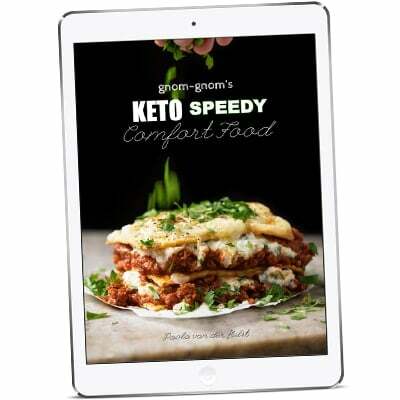 What we are essentially doing here at Gnom-Gnom, is developing gluten free recipes which attempt to maximize the harder flours with higher nutrition density profiles, while limiting the use of starches. No one likes empty calories after all. So read through below for a comprehensive list of the most popular gluten free flours currently out there. ?? Suuuper Pliable Gluten Free ‘Flour’ Tortillas ? Starches are essential in gluten free baking to ‘air-up’ the harder flours, resulting in a more tender and airy crumb. They each bring a little something to the table, so try to have at least two in your gluten free flour mix. Potato starch and tapioca are our essential picks. Potato starch, tapioca, and arrowroot are root and tuber starches, that will gelatinize at relatively low temperatures. So when used as thickening agents, they are ideal when added at the end of cooking. Cornstarch meanwhile, is a grain starch just like wheat flour (albeit a more effective thickening agent). It will however, require a higher temperature to gelatinize, so it is best used in dishes such as stews, which require thickening to start from the beginning. Arrowroot powder is a flavorless starch which is primarily handy as a thickening agent. And because it can stand acidic environments (unlike cornstarch which breaks down), it is ideal to thicken fruit sauces and pies. Add it by making a slurry (i.e. mix it with water) prior to adding it to your sauce, just as you would with cornstarch. But be sure to remove form the heat as soon as thickened, as it will break down with excessive heat. Cornstarch, derived from corn, is a great thickening agent. Because of its ability to soak up liquid, it is rather essential in gluten free baking to get a nice crumb. It is also great in yeasted breads to achieve a nice crust and in cookies to up the crunch. Cornstarch, however, varies a lot in quality and origin so look for a non GMO variety with no add-ins. Oh, and to thicken sauces, be sure to make slurry (i.e. mix it with water) to avoid clumps. We are talking potato starch here, not flour, a very important distinction. Potato starch actually brings in moisture to baked goods. It is sometimes used in flour tortillas in Mexico in order to increase tenderness, while reducing required added fat. Tapioca starch, otherwise referred to as tapioca flour, is also a great thickening agent and can be used interchangeably with corn starch in almost all thickening applications. It is also an essential part of our gluten free flour mix, due to its ability to provide lightness when used along with harder flours. Wholesome Gluten Free Sandwich Bread ? Fave bean flour, known for it’s earthy flavor and as a great source of protein, is rarely found on its own. Rather, it is commonly found in mixes with garbanzo flour. When baking, it is very similar to garbanzo flour, making it a nice addition to yeasted breads. Garbanzo or chickpea flour has garnered a reputation out there for leaving an unpleasant aftertaste in gluten free goods. But guess what? This is only if it used as the main flour in the mix. When used correctly, garbanzo flour will add fantastic bite in pretty much any baked good, with no discernible taste. It is also one of the best gluten free flours for proper rising and browning. So if your gluten free goods are coming out of the oven white as a unicorn, your mix has too much rice and starch and you should consider mixing in some garbanzo flour. Unlike its name suggests, there is no gluten in this traditionally Asian (primarily Thai) rice flour. Rather, glutinous rice flour gained its name for being super sticky and binding. Making it a useful flour in gluten free baking, when added in small amounts, to mimic gluten. Millet, a small-seeded grass primarily grown in Asia and Africa, is mostly associated as being the primary component in bird food. Though due to its high nutritional properties (think rich in copper, phosphorus, manganese and magnesium!) and lovely taste, millet flour is a lovely addition to yeasted breads. Oats likely need no introduction. With a super complete nutrition profile (think manganese, molybdenum, phosphorus, vitamin B1, biotin… ) and a lovely taste, they are a good gluten free flour to have handy. Oats soak up a tonne of liquid, so only add it in small amounts. Having said that, make sure you opt for a gluten free oat flour. And if you are recently diagnosed and new to a gluten free diet, even gluten free oats can trigger an immune response. So be sure to avoid oats for at least the first six months and gradually add them in. We are including quick cooking oats to our list of gluten free flours, given that when added in small amounts to moist breads (think carrot cake and banana bread), it removes any gumminess without drying up the loaf. And no, you will not see a single oat in sight. Quinoa flour, like regular quinoa, has a killer nutrition profile and a very distinctive taste. It is also one to absorb quite a bit of liquid, so be sure to use it sparingly. We find that it works best in savory quick loafs and scones. A staple of gluten free baking, white rice flour is indispensable in most (if not all) mixes. But it’s rather refined and not particularly nutrient-dense, so we like to mix it up with less refined options. Oh, and be sure to use a superfine rice flour (i.e. not Bob’s), or you’ll end up with gritty results. 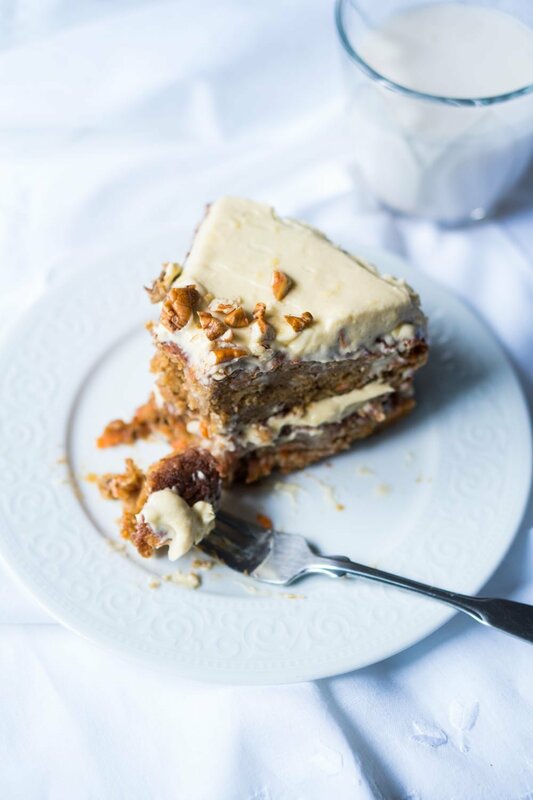 Suuuper Tender & Moist Gluten Free Carrot Cake ? Almond flour, low carb as well as gluten free, comes in two forms: meal and flour. Almond meal is generally the result of ground whole almonds, resulting in a darker color and coarser texture. Meanwhile almond flour are blanched almonds processed into a suuuper thin powder. For baking we generally recommend using a super fine almond flour, although if you’re making our cherry & ricotta chocolate torte you can use either! Amaranth is a nutrient powerhouse with killer taste. And while generally found in Mexican sweets, it’s great for gluten free baking. Amaranth flour comes in two versions: the one from finely ground amaranth seeds, and the one from finely ground popped amaranth. We generally prefer that from popped amaranth. We suggest to buy the popped amaranth, use it as a snack or cereal and granola add-in, and ground up a bunch in your food processor as needed. We’re all about double-duty ingredients. Like its white rice counterpart, brown rice flour is a staple of gluten free baking and indispensable in most (if not all) mixes. And although less refined and nutrient dense, we suggest to only consume it in small amounts due to the higher arsenic traces commonly found in it. Buckwheat flour likely needs little to no introduction, as it has long been a staple in anything from pancakes, waffles to fresh pasta. A fruit seed related to rhubarb, buckwheat is an ideal substitute in gluten free baking. It ranks low on the glycemic scale, contains a higher amount of protein than rice, wheat, millet and corn, and is a good source of magnesium. Buckwheat is a food to be reckoned with. 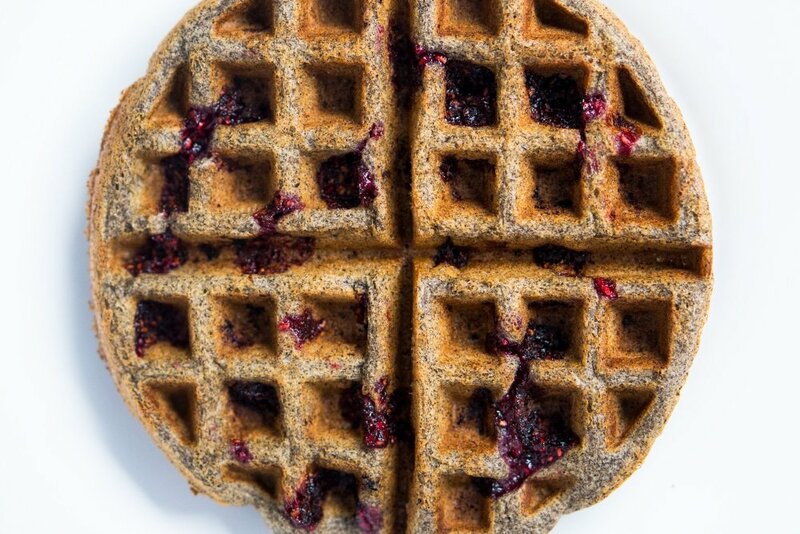 Gluten Free Buckwheat Waffles with Raspberry Swirls ? Cassava flour has been gaining traction as one of the most popular gluten free flours for baking, as it’s gluten, grain and nut-free. It’s made by grating the the yucca root (where tapioca is derived from as well). It’s great throughout baking due to it’s neutral taste. Seconded only by its ability to yield great textures (similar to those of garbanzo). Coconut flour, like almond flour, is also low-carb as well as gluten free. Super rich in fiber, this flour is an essential to paleo and keto baking. Just be careful when using it as it absorbs a lot of liquid, reason why you generally won’t add more than 1/4 cup to a recipe. And you will need to use eggs, loads of eggs. Anthony’s coconut flour is our far favorite, but Bob’s is very good too. 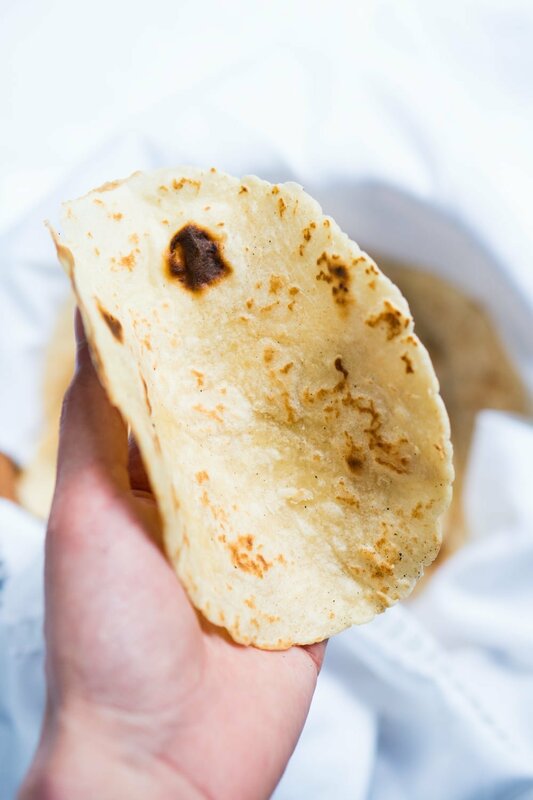 Corn flour, otherwise known as masa marina down in Mexico, is what corn tortillas are generally made from. Oh, and you can make tamales with it as well! Hazelnut flour or meal, just like it’s almond counterpart, is the result of blanched and ground hazelnuts. It’s generally combined with almond flour due to it’s overwhelming flavor, and it’s an ideal pairing to anything chocolate. Think hazelnut & salted chocolate tarts. Sorghum flour is the fourth staple in gluten free flour mixes (after tapioca, white and brown rice). Sorghum is an ancient whole grain filled with nutritional benefits: suuuper high in niacin, riboflavin, and thiamin and rich in magnesium, iron, copper, calcium, phosphorous, and potassium. As well as providing nearly half the required daily protein intake. Plus, you can either use the flour in baked goods, or snack on the grain popped like popcorn. 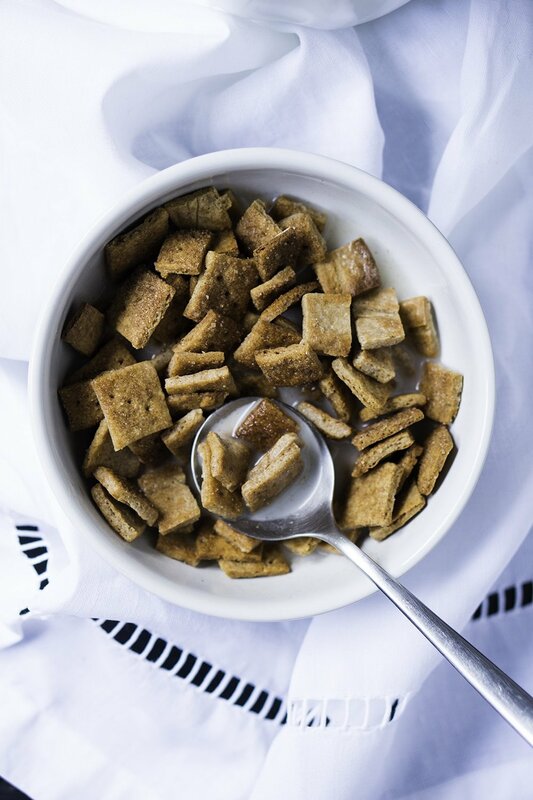 Teff, the smallest grain in the world, is an ancient cereal grass native to Africa. It’s flavor profile is very similar to rye, making it an ideal addition to wholegrain yeasted breads. Oh, and let’s not forget it’s ideal pairing with chocolate. So be sure to add it to anything from brownies (up to 1/3rd of the total flour weight), to chocolate cakes or tortes (up to 1/4th of the total flour weight). Teff flour is a must. ?? Oh, and Bob’s is good enough (no need to splurge on Anthony’s here!). Our essential pick for binding agents in gluten free baking is of course, xanthan gum. But psyllium husk is also a fantastic addition if you whip up homemade yeasted breads. Guar gum is a thickening agent derived from the guar bean. It’s a relatively good substitution to xanthan gum, but it’s results can vary widely. So we don’t recommend it, unless you have an adverse reaction to xanthan gum (which has been known to happen). Psyllium husk is a fiber derived from the husks of the Plantago seeds. Low in carbs and super rich in fiber, it’s used in natural medicine as an aid in constipation. ? And in gluten free baking it is an excellent addition to anything yeasted. You see, psyllium husk adds moisture when baked, which makes it great to avoid dry and dense goods. 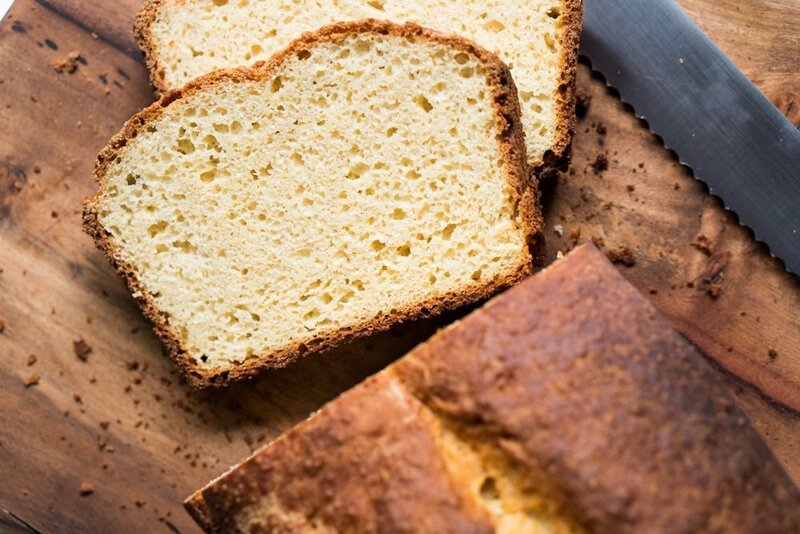 Plus, when mixed with the right flours, wave goodbye to liquid gluten-free doughs. ?? Borrowed from molecular cooking, xanthan gum is the binding agent which makes your toothpaste jelly-like. And it’s also the most common gluten-replacer in gluten free baking. p.s. it’s derived through a fermentation process using the strain of bacteria Xanthomonas campestris. So now you know where it’s name comes from. Go do some gluten free baking now! ?? ? I’ve been baking gluten free for years and the stuff i use wasn’t even listed here. I use mainly superfine white rice flour and sweet rice flour as well as sweet potato flour and konjac root powder for binding. Konjac is much better because it’s better for you and you don’t have to worry about contamination or issues like you do with xanthan gum and guar gum. Would you please suggest a GF flour mix to use when baking a British fruit Christmas cake? I’ve had to go without Christmas Caje since I was diagnosed with GF intolerance. Please include me on gluten free recipes! Informative and helpful about different flours! I have been mainly using almond flour for baking but appreciate these insights! Thanks! I have added back in eggs after elimination phase! Thank you for this great overview of the gluten free flours. Could you clarify adding 2 light gluten free when mixing flours. I am making a pound cake that requires 3 cups of flour. I have almond, coconut and oat GF flour. So I believe I should use the almond and mix with coconut? A what would be the ratio of flours whe mixing? Thank you for all of this enlightening information. So well organized. I have one question. We are new to the world of gluten free. We discovered gluten was giving our son terrible stomach aches. This will be our first year trying to bake Christmas cookies (a really big deal in our house) gluten free. Which flour is best for cookies? Paola has some super recipes for gluten free cookies. I love her Snickerdoodles and I am going to mix up a batch of Gingerbread People for Christmas this year. 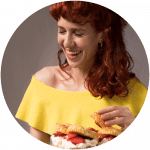 Good luck discovering gluten free baking with Paola.. Gnom gnom is my go to site for recipes. Donna SO sweet of you to say! Hope you love the gingerbread peeps 😉 xo! Thank you! I’ll definitely check those out! OMG … best article ever! Thank you for taking time to put all this wonderful knowledge together in one place… it is my new and only page for understanding the flour craziness in gluten free flours. Thank you again. Very helpful! Have you tried Namaste flour? I find it at Sprouts. Also, what do you reccomend to use for making filo dough. Thank you! I use Namaste flour to bake my GF bread.The recipe for the bread is their own, and use for machine or oven. The bread is fantastic and easy to make. This is the best list ever! Most helpful in understanding the differences. Thanks so much! Thank You! Appreciate this indepth list and how to use each gluten free flour or binding agent ?? Thank you Lori! Glad we could help ? Super thorough. Just the summary I was looking for, thanks! Have you tried gf Jules flour. I have not found anything I can not use it for yet. Best Gluten Free Flour! Thanks for the heads up (Jules gf mix seemed to have gone missing when adding the post!). We love it as well for most things (it’s in fact one of our top choices and it works well with most recipes here). What we’re not huge fans of, is its high percentage of Expandex modified tapioca starch. Which can at times yield gummy results (i.e. banana breads and other high moisture breads). And it’s also not particularly nutrient-dense.